The end of the jubilee Year of Mercy is approaching, and Father Michael Gaitley is coming to Benedictine College to help close the year out. The Marian of the Immaculate Conception priest plans to give a talk on campus Oct. 19 at 7 pm (on-campus location to be determined). The popular priest is author of the Marian consecration book 33 Days to Morning Glory and visited campus in 2013 to help celebrate the consecration of Benedictine College to Mary. He helped lead hundreds of students to consecrate themselves to Mary that year. 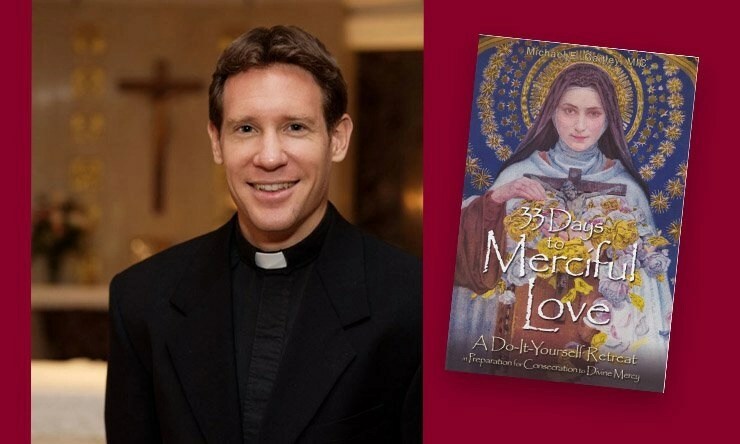 His follow up “do it yourself retreat” book for this year is called 33 Days to Merciful Love and focuses on the devotions of St. Thérèse of Lisieux and St. Faustina. Archbishop Joseph Naumann is recommending Father Michael’s book for the close of the Year of Mercy in the Archdiocese of Kansas City-Kan. In a recent column, Archbishop Naumann reported that “busloads of pilgrims have come from both Kansas and Nebraska” to walk through holy doors in the Year of Mercy. St. Benedict’s Abbey Church on the campus of Benedictine College is one of the designated Year of Mercy Holy Door shrines in the Archdiocese.